In the depths of Kensington Parks a couple escape the outside world to enmesh themselves in a special intimacy. Parisian radio interview on living with acrophobia, the fear of heights. We are constantly looking at the extremes of FEAR, through the lens of psychological thrillers and horror films. James Stewart in Hitchcock’s “Vertigo” is paralysed as he dangles from the roof of a high-rise building. This reaction seems fairly normal, given the circumstances. But what if your biggest challenge was just a metre from the ground? About 8 yrs ago Ian Richardson reached out to an online group for people suffering from Acrophobia. His entire life had been shadowed by disability, and, at the time, he didn’t know where else to go. In the film, Stewart climbs to the top of a church bell tower to conquer his fear. But regardless of how high you climb, this kind of exposure is often just a temporary fix. At 58, having tried almost everything, Ian finally has some answers. At the heart of Palindrome is 12 year old Robert Deed, an insular boy with burgeoning psychic powers. The story is set in Haddington, near Edinburgh – it’s 1975. Here change is a process slowed by tradition and the luxury of a certain distance from the swift progress of the rest of the world. Robert’s 13th birthday approaches. He is a teenager who looks beyond a thing and sees inside it. But this birthday brings more than a coming of age celebration for Robert. He will feel forced to solve the murder of his first crush, battle his grief, re-evaluate his relationship with his parents and exonerate a dear friend. One day Robert will be a detective who solves murders others cannot. Ideally we’d like to be interviewing him right now, but Robert is solitary and avoids the limelight. So we’re going to ask someone who knew him well while he was living in Haddington: Gabriel Haskey, school librarian at Knox Academy, now retired and living in Crete. Mr Haskey – it wasn’t so long ago that you knew Robert fairly well. What was he like when he was at Knox Academy? Robert hasn’t changed all that much. I haven’t seen him since his 15th birthday. But he writes me long thought provoking letters. Always been a deep thinker. Likes his own company. Reads voraciously. What’s the first thing you notice about Robert? His nose is always stuck in a book. What was his relationship like with his classmates? Never quite one of them you know. Always stood apart even when he was part of the crowd. Quite good at Rugby but preferred to be off somewhere reading. Academically he was superior. At first I wondered if they would bully him because of this but it never seems to have been the case. Were his psychic abilities very evident when you were around him? I always thought there was something special about him. His mother’s very gifted you know. So it’s not altogether a huge surprise. Do you know the full extent of his powers? Heavens no! Robert never discussed the matter with me. He always did have some amazing insights and ideas on why certain themes and motifs were present in writer’s work. I imagine that is part of his gift. Though the fact he didn’t see fit to share it with anyone makes me think he wasn’t sure if it was a gift or a curse. Rowena Deed was all but shunned for her obvious talents by much of the community you know. What was Robert’s relationship like with his parents? His father Arthur was very strict. He’d had a strict upbringing himself so I suppose he felt that was what it was to be a father. There was no real communication between father and son until after they moved to London. Rowena now, she was different. Her approach was much more holistic, I’d say. While it was obvious Robert’s respect for his father superseded any other familial feeling, there was no doubt of Robert’s love for his mother. Some would even say he was a bit of a mummy’s boy. Palindrome is due for release on 27th July. To celebrate, Six Dead Men is currently available FREE exclusively through Instafreebie for e-readers until mid August. Rae Stoltenkamp was born in South Africa and came to England in 1987 to visit family. She liked the weather so much she stayed. After a writing holiday in Greece she had an epiphany and realised she should be writing on a full time basis. It was probably heat stroke since she hadn’t had sun in a while. She then studied writing at City Lit with the poet Caroline Natzler and is now a self-published writer, blogger and English tutor living in South London. Rae currently works for a local charity (Young Women’s Hub) teaching English and also runs creative writing workshops and after school clubs with www.inkhead.co.uk. Her published work includes poetry in Prole, Fantasy for children, Science Fiction for young adults and Magic Realism for adults. As well as her writing, Rae has a passion for Lindy Hop and Argentine Tango. When she’s not chained to her desk and laptop, you can often see her tripping the light fantastic with her dancing friends. 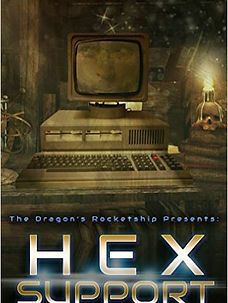 Join 16 authors as they share some of the stories from the Hex Support staff.